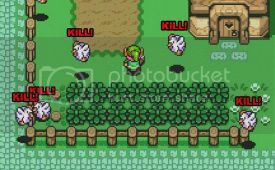 The Legend of Zelda games are so universally lovable that its oddities and morbid pitfalls can be overlooked. But the strangeness of the Zelda games are what make them so unique, despite how crazy parts of them may be. Its impressive mythology along with its unintentional creepiness help transport you to a separate world of equal parts wonder and peril. Most people love these aspects of the games, I being one of them, and wouldn’t dare to normalize the franchise. However, analyzing these peculiarities can be quite humorous and helps draw your attention to quirky things that wouldn’t normally stand out. The most recent of these efforts comes from the website GamesRadar. They have compiled a list of the seven things they find most disturbing about the world of Zelda. The list seems to double as a comical piece and an insight into the strangeness of the franchise and the Zelda mythology. Despite the humor used, the list has some good points such as when they discuss the major faults of the Triforce, which they rank at number one, and when they point out the messed up climate of Hyrule overall. I have to agree with both of them strongly, especially the former. But the comedic quality still shines through well such as with numbers four and five. It’s definitely worth reading. View it here.